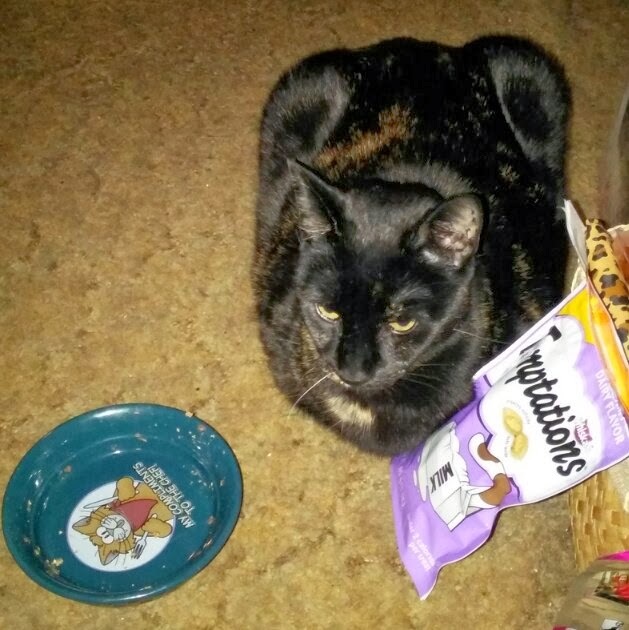 Hmmm... your Mommy has placed a "'TEMPTATIONS" bag of treats next to you whilst expecting you to smile for the camera as you starve to death...I say, to heck with waiting - tear that bag apart (I will help you!). I love Truffles bowl! She certainly deserves some Temptations now! If it was up to us, Truffle, you could have the whole bag! Adorable. We hope you obliged and gave that sweetie pie some Temptations. Purrs and paw-pats, Lily Olivia, Mauricio, Misty May, Giulietta, Fiona, Astrid, Lisbeth and Calista Jo. Sounds like a plan.. now, did you actually get dessert? She's wanting you to hurry up and open that bag! That bag of treats looks tasty! truffles...ask for sum pie.... cake... ore donuts !!! ah...but how many treats did truffles taste? that is the question. - Crepes. Cute! My cats love Temptations too!